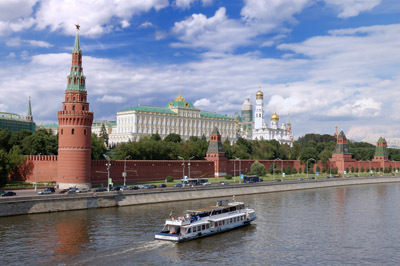 The Moscow Kremlin, also called the Kremlin, is a castle that is situated at the heart of Moscow. It has four palaces and four cathedrals and it is the official residence of the president of Russia. The great Kremlin Palace is one of the biggest castles in all of Russia. It has a very stunning combination of yellow and white with a green rooftop. The golden color adds an appearance of wealth to the entire palace. The palace was initially built in 1462 during the rule of Ivan the Terrible, but was rebuilt in 1837 by King Nicholas I because of the extensive damage that was done to it during wartime. During the 18th century, the construction came to a halt as the entire Russian capital moved to St. Petersburg. It was in the 1740s when an Italian architect was hired by Queen Elizabeth to complete the Kremlin and the construction began once again. The Kremlin Palace was built to extend the Russian autocracy. The best architects were hired to perform the splendid job and they came up with a fine piece of art. The dimensions of the palace are massive. The total length of the palace is 125 meters and the height is 47 meters. It covers a total of 25,000 square meters. The whole building has nine churches from the 14th through 17th centuries with more than 700 rooms in it. The west side of the palace was for the royal family. Just like many other palaces, this one is also off limits to public viewing. Who really is Ivan the Terrible? I think this is an AMAZING place that I’d like to visit. I can’t believe it’s that big!!! i hope i can visit there.such a dream. The Kremlin is one of Russia’s former known governmental buildings to spread the autocracy around the Motherland.